Artists Jeff Stark and Todd Chandler have built a monument to car culture and media with their latest project, the Empire Drive-In. 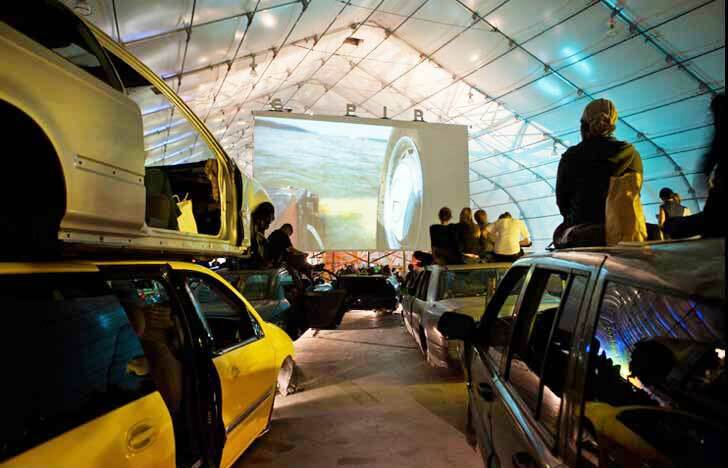 First commissioned for the Biennial in San Jose, California, audience members sit in cars rescued from the junkyard and listen to the movie through low-power radio transmissions. In addition to a snack bar, the theater features a giant 40-foot screen constructed from salvaged wood. The Empire Drive-in was originally created to showcase Todd Chandler’s film, Flood Tide. The artists wanted a venue that reflected the story’s overall themes of creative reuse and finding value along the margins. More importantly, they hoped that the theater would provoke a discussion about the relationship between culture, the automobile, and planned obsolescence. Chandler and Stark specifically chose Ford Escorts and Nissan Altimas instead of vintage cars to make a statement about the disposable nature of current transportation. “We work with found objects and recycled materials whenever possible; there is no shortage of perfectly good garbage. But we also work with found objects because they contain stories. Each piece of wood or old door has had several lives before it touches our hands. We are interested in this accumulation of narratives, the silent, collective histories held in our discarded objects. This is most evident in the cars,” says Stark. Audiences are encouraged to explore the vehicles, climb on top of them, hunt for treasures left in the glove boxes, and note how the sound changes between each interior. Stark and Chandler initiated this project not out of a sense of nostalgia, but as a tribute to a failed enterprise and disintegrating business model. The Empire Drive-In will appear at the New York Hall of Science in Queens, New York from October 4-20.. 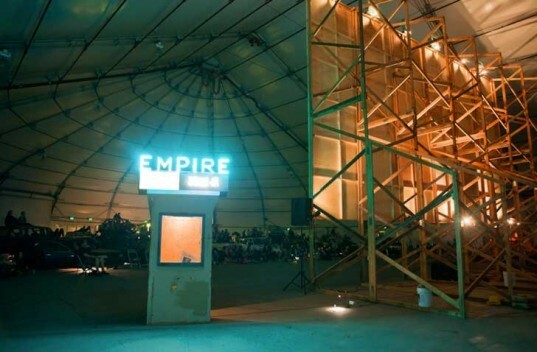 The Empire Drive-In resurrects car culture in a movie theater dedicated to creative reuse. Audience members can listen to the film through radios placed in each car. The artists wanted a venue that reflected the story's overall themes of creative reuse and finding value along the margins. More importantly, they hoped that the theater would provoke a discussion about the relationship between culture, the automobile, and planned obsolescence. The Empire Drive-In features a snack bar to complete the movie-going experience. Audiences are encouraged to explore the vehicles, climb on top of them, hunt for treasures left in the glove boxes, and note how the sound changes between each interior. Stark and Chandler designed the project as a monument to a failed enterprise and disintegrating business model. The artists chose Ford Escorts and Nissan Altimas instead of vintage cars to make a statement on the disposable nature of current transportation.